So, the countdown is on at our house…7 days until summer break officially begins! My daughter will finish up her second year as a middle-schooler and wanted to give her teacher’s a little gift for all their hard work. I used a porcelaine 150 , fine tip pen to write on these dollar store mugs. I chose a definition of “teacher” ! I followed the directions on the pen for curing the lettering. You could also use a Sharpie pen to do this. 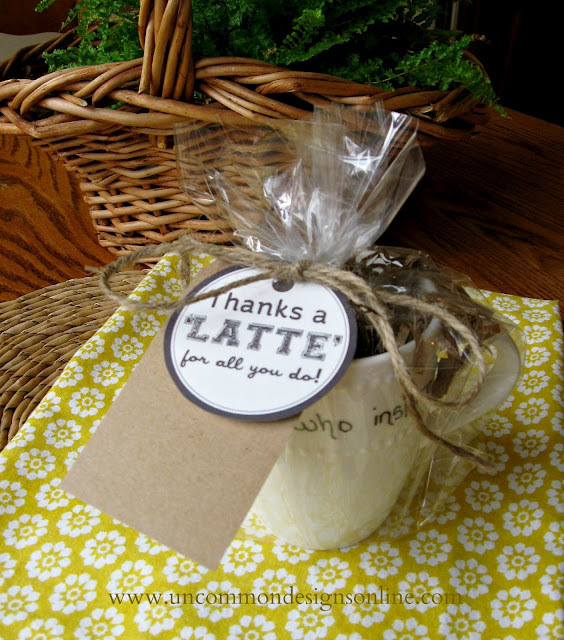 Next, I found these adorable little “Thanks A Latte” printables over at Skip To My Lou! I also cut out simple brown cardstock gift tags for my daughter to write a personal note to each of her teachers. Each mug was filled with brown, shredded paper from the dollar store, and a coffee gift card was place inside. Finally, we placed each mug in a cello bag and tied it closed with jute twine and the tags! A fabulous gift idea to get the kids involved in as well! 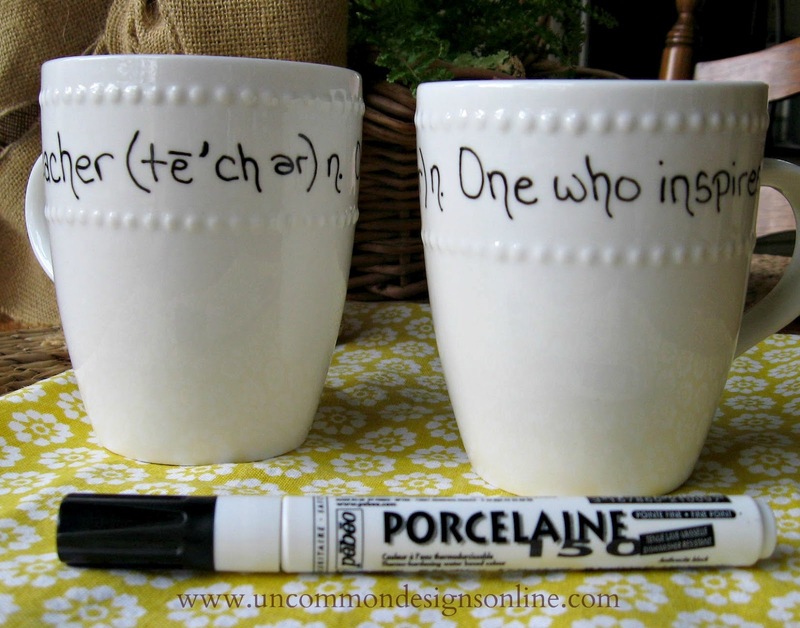 This end of the year teacher’s gift is…. Simple, stylish, and not a wee bit “little kid”! Oh, and if you happen to be one of my daughter’s teachers…please act surprised when she hands it to you!! 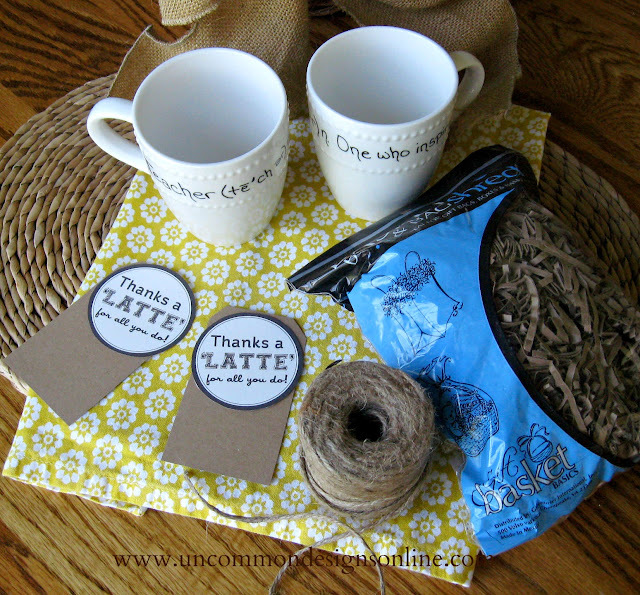 This adorable and simple Teacher Appreciation Tote Bag and Free Printable. So, who’s ready for summer? This post may contain affiliate links. See our disclosure statement. I think this is a great middle school teacher gift. I always struggle with giving something to my Jr. High son’s teachers because there are so many of them…plus also, he rarely remembers to turn in his assignments let alone give a gift to his teacher that his mommy sent him with! But these are great! I’m sure they will love them. This is super cute! I love all your teacher gift ideas this year! I love this! It is so cute. Thanks for the tip on the printable too. So cute! Thanks for linking it up at Grits & Giggles! Ha, ha! I love a good play on words kinda gift. I’m sure they’ll love their gifts. Too cute! As a teacher I would have loved this, as a parent I will totally make this! Thanks. Found you though “I Made This” blog hop and will be following your great blog. I blog over at http://thehandleyhome.blogspot.com/2012/05/tire-swing.html. Have a great day! You two creative ladies are STARs tonight over at I Gotta Create! Thanks so much for linking up your amazing projects! I really love this teacher appreciation gift. As a school librarian/teacher, I love receiving gifts like this one…personalized, functional, and satisfying my coffee fix! Hi there! what size of cello bags did you use? so cute!